Driving into the Downs on a sunny Thursday evening, I could feel the stress of my workday melting away. My friend Hanna and I were en route to Cuckfield – a quintessential English village with winding streets, pretty cottages and a reputation for good food. Here to sample the latter, we pulled into the car park of a 17th century coaching inn, The Rose & Crown. Greeted at the bar, we were seated in the adjacent dining area. 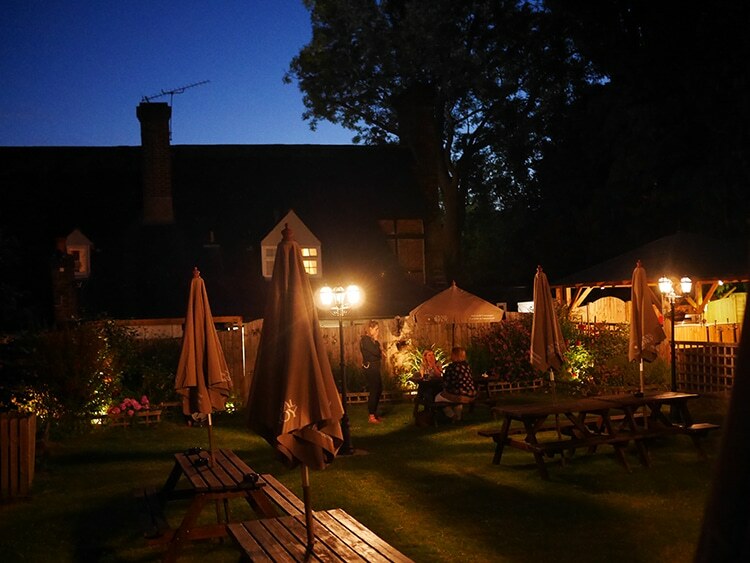 There’s also a pub area for drinkers and a ‘lounge menu’ plus a pretty garden at the back. 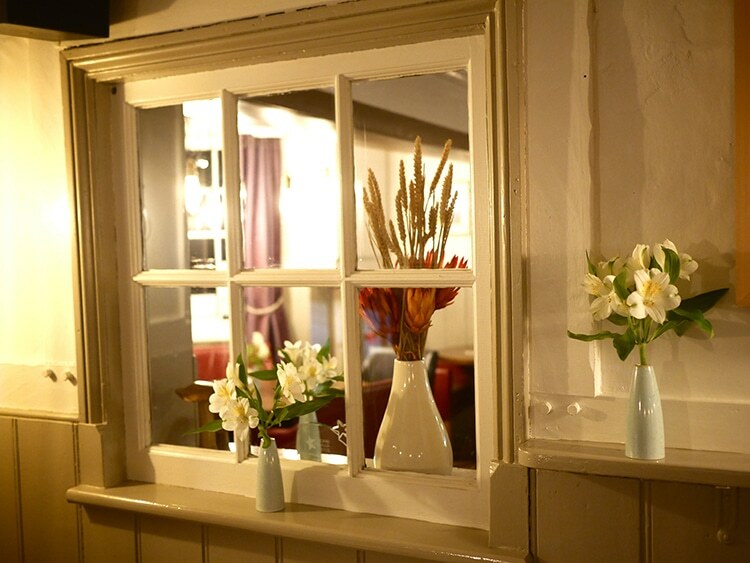 With open fireplaces, exposed beams and painted panelled walls, the pub’s original features have been cleverly refurbished to give a fresh and relaxed, cottagey feel. “Fine dining doesn’t have to mean stuffy,” the cheery co-owner, Mark Dennis, enthused when he came over to introduce himself. 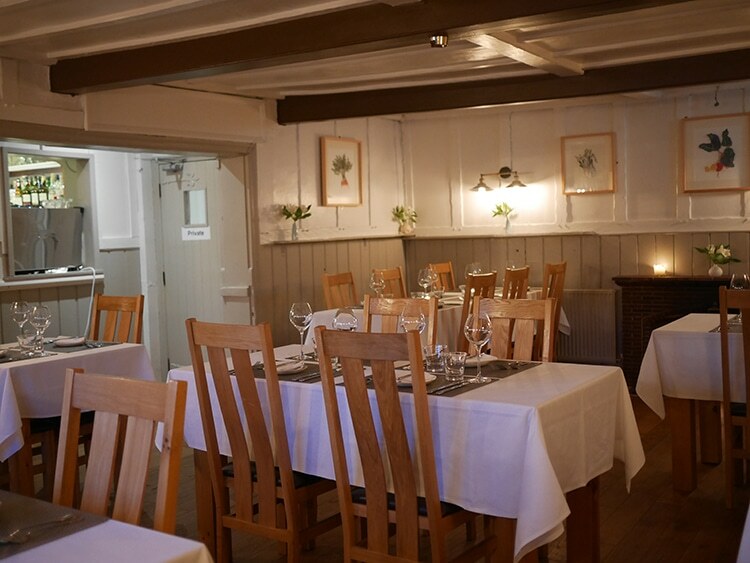 Mark bought the pub three years ago with his chef son, Simon Dennis, while the contemporary artwork on the walls is supplied by his daughter. We were given a choice of two menus: the eight course ‘tasting menu’, or ‘a-la-carte’. Our bubbly waitress also revealed that the ‘steak of the day’ was sirloin, and that today’s tomahawk sharing steak was particularly good. This left us with some tough choices. 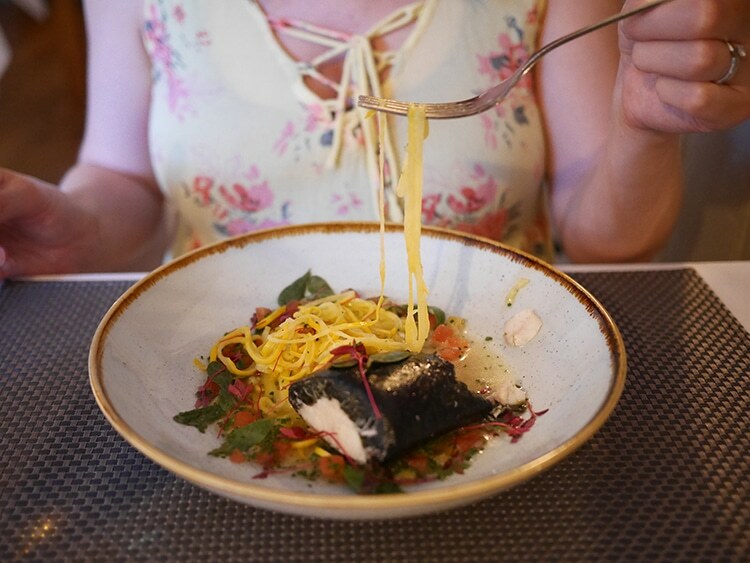 The tasting menu and steaks sounded fabulous but, on a sweltering summer evening like this, we were both drawn towards some of the summery sounding dishes on the seasonal a-la-carte menu. There’s also the option of a wine flight with the tasting menu, while every dish on the a-la-carte menu includes a recommended wine pairing. Sadly, we were both driving, so we’d have to restrict ourselves on this occasion. Selecting from ‘dry, herbaceous or aromatic whites’ I opted for the Vidal Sauvignon Blanc – a crisp New Zealand white with melon and tropical tones. While we waited for our starters, we nibbled on homemade focaccia with wild fennel butter. 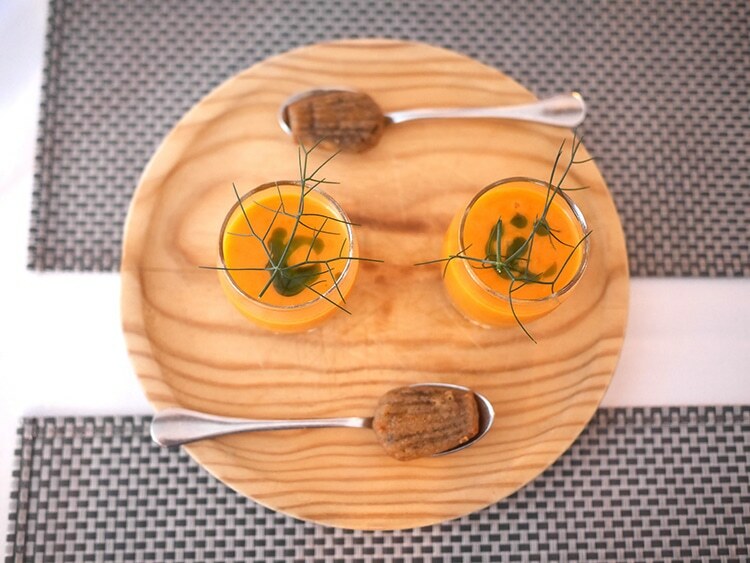 Next, we were served am amuse-bouche of gazpacho with olive madeleines. I’m not a fan of cold soup but, out of politeness, I took a sip. To my surprise, I loved it. Buttery smooth and refreshingly cold with a drizzle of basil oil, it was a real revelation and the perfect start to our summer meal. For my starter, I ordered the heritage tomato and burrata salad. Although seemingly simple, it was packed with flavour. 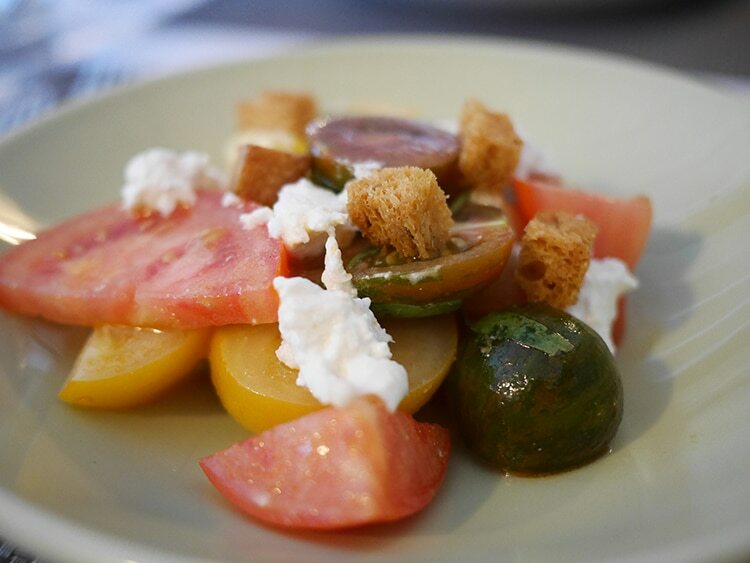 A plate of red, yellow and dark green tomatoes arrived, lightly dressed, and scattered with crunchy croutons and torn burrata cheese – like mozzarella but richer and creamier. Hanna loved the sound of the English Asparagus with goats cheese granola but, unfortunately, she’s unable to eat goats cheese. The kitchen kindly offered to serve it without, offering a degree of flexibility that, in my experience, is rare in fine dining restaurants. 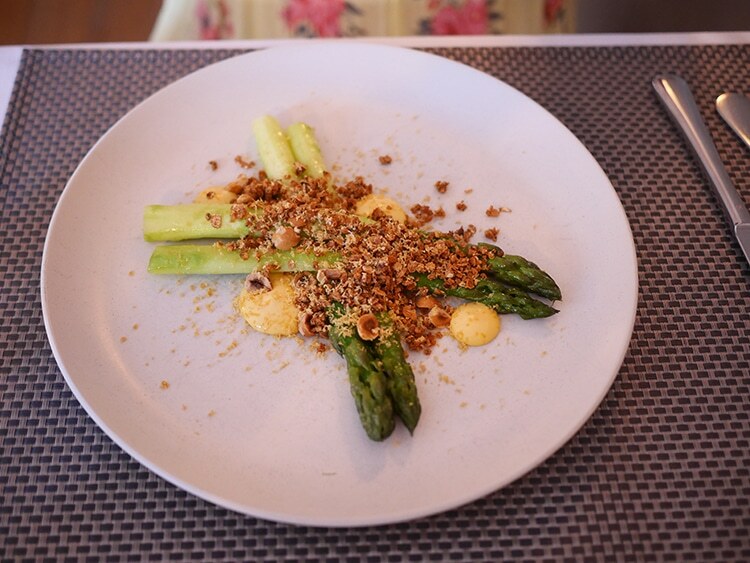 Her warm asparagus was vivid green, and the granola featured a full spectrum of crunch, from breadcrumb-like bits to big hazelnut halves. Served with gooey cured egg yolks, the textures were incredible, and I have no doubt that a crumble of salty goats cheese would have set it off even more. 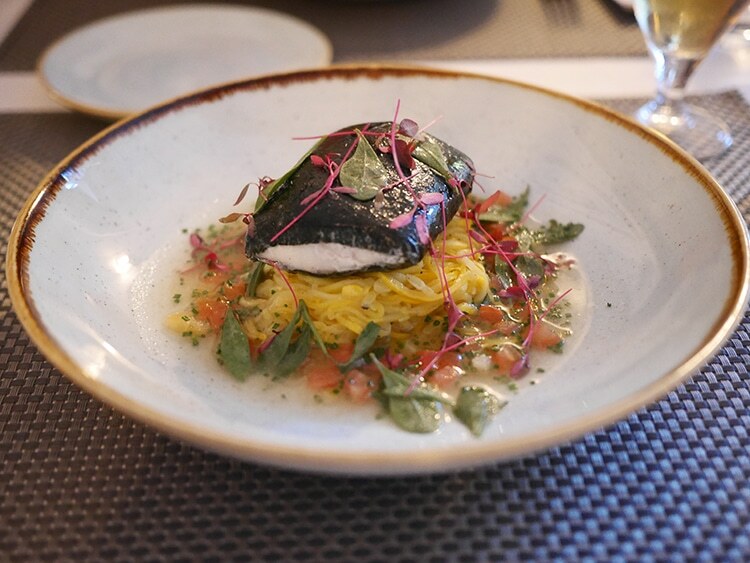 Moving on to mains, Hanna’s poached sea bass looked as striking as the artwork on the walls. Shrink-wrapped in Japanese Nori (seaweed), her snowy-white fish sat on a bed of al-dente courgetti that was a far cry from the soggy strands I’ve tried cooking at home. Served in a clear, tomato infused broth, this beautiful plate of food was finished with pretty pink ‘red amaranth’ and green ‘sea purslane’ leaves which had a marvellous sea salt flavour. 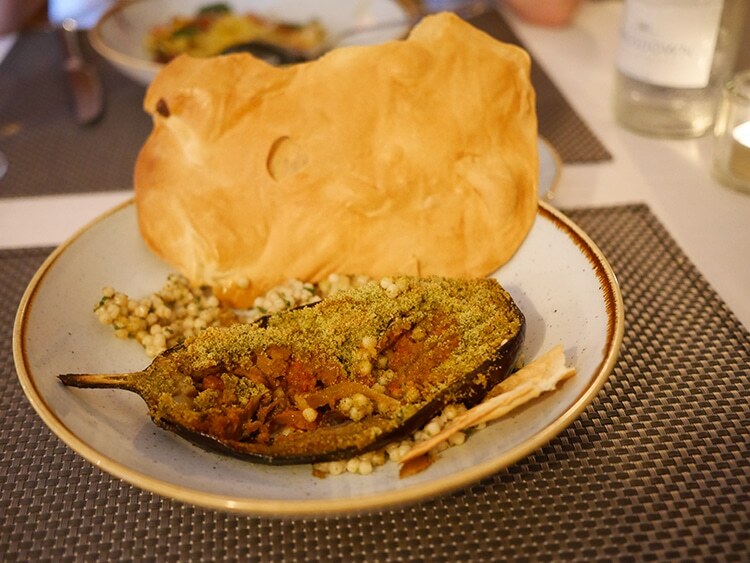 Across the table, I was tucking into stuffed aubergine with lemony giant couscous and an enormous ‘lavosh’ (Middle Eastern flatbread). Richly flavoured with warm spices, my aubergine was topped with a dust-fine mint crumb. 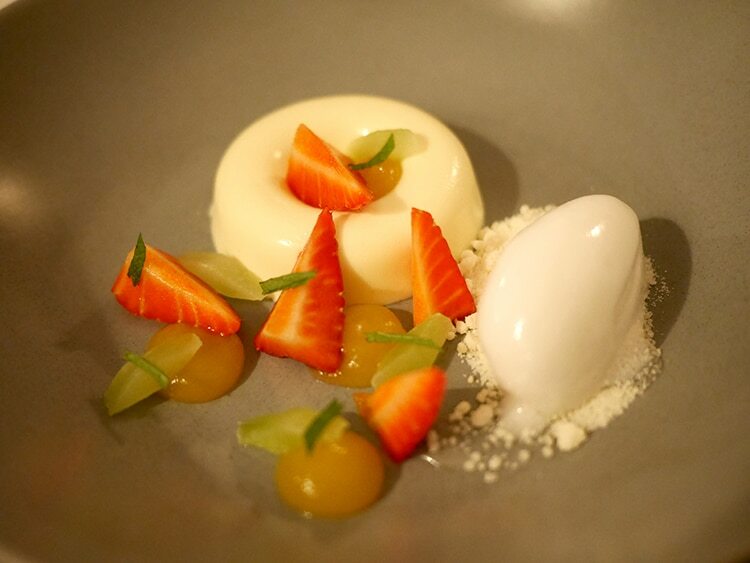 Continuing the summer theme, I chose elderflower panna cotta with compressed cucumber and Pimms gel for dessert. It arrived with English strawberries, fresh mint, elderflower sorbet and a sherbet-like white chocolate crumb. Incredibly inspired, it was like eating strawberries and cream with a jug of ice-cold Pimms on the side – quite literally, summer on a plate. 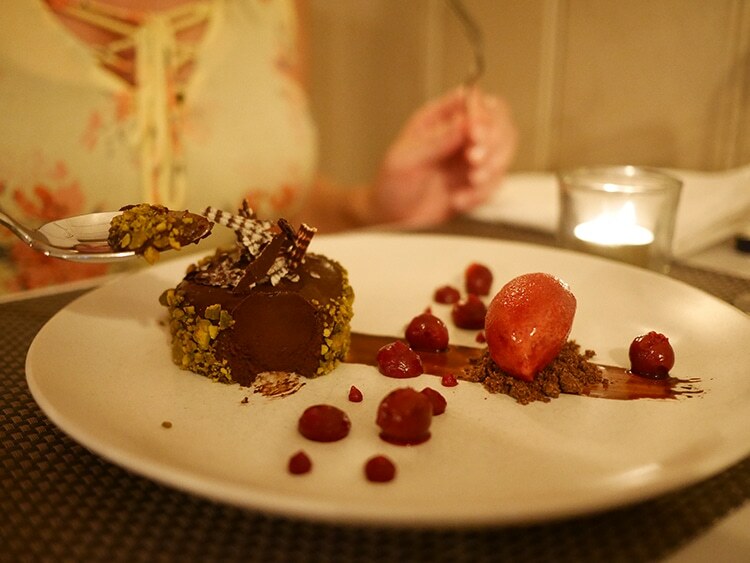 Hanna insisted that her dessert was even better: encrusted in cracked pistachio nuts, her dark chocolate marquise was rich, dense and decadent. She found poached cherries hiding in the centre of her marquise, which was topped with an intricate chocolate flake that Paul Hollywood would have been proud of. On the side, a scoop of cherry sorbet gave balance to the rich chocolate. Before dragging ourselves away for the drive back to Brighton, I ordered fresh mint tea, which was served with homemade honey and cinnamon madeleines. Serving the sort of food that you’ll talk about for weeks, The Rose & Crown is a real treat. After our superb summer meal, I can safely say that I’m now a gazpacho convert with a penchant for Pimms gel. I’m already lining-up a return trip to try the tasting menu – perhaps I’ll book a taxi next time, so I can work my way through that wine flight.